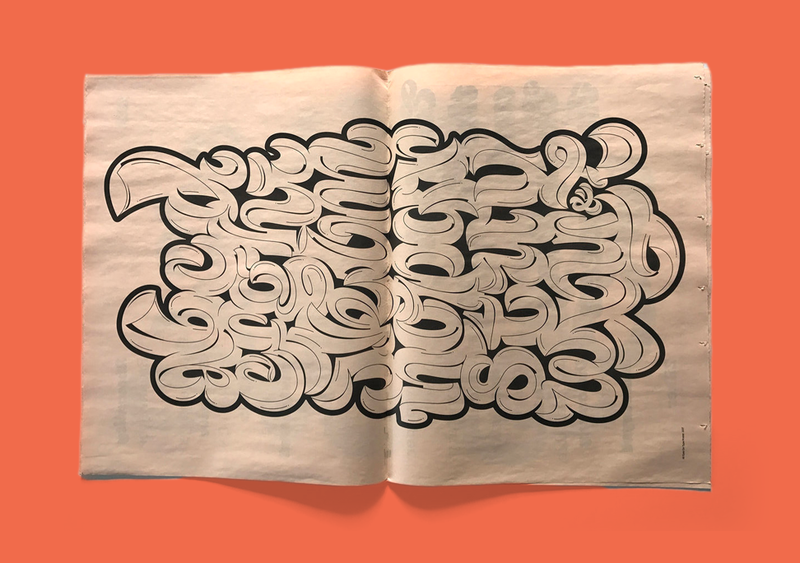 Meet Mark Caneso, a Portland-based typographer whose lettering can be found on everything from hot sauce labels to ambigram doormats (which read "Home" or "Away", depending on where you're standing). 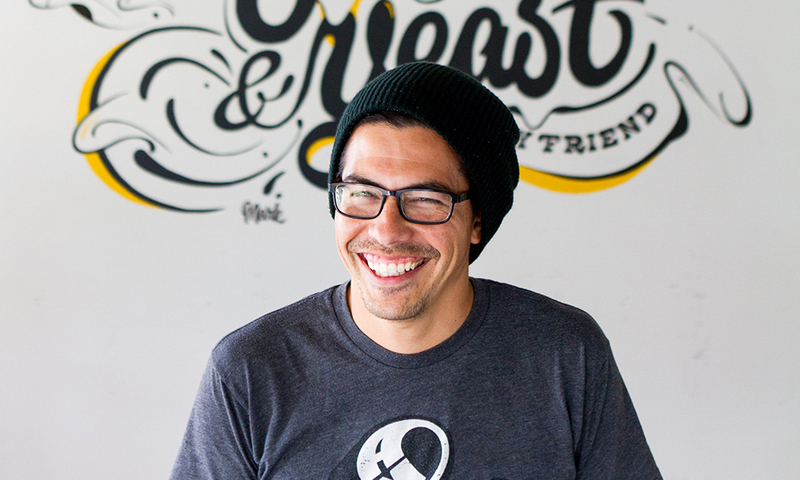 Since 2004, Mark has run his own graphic design company, pprwrk studio, which includes the digital type foundry ps.typelab. 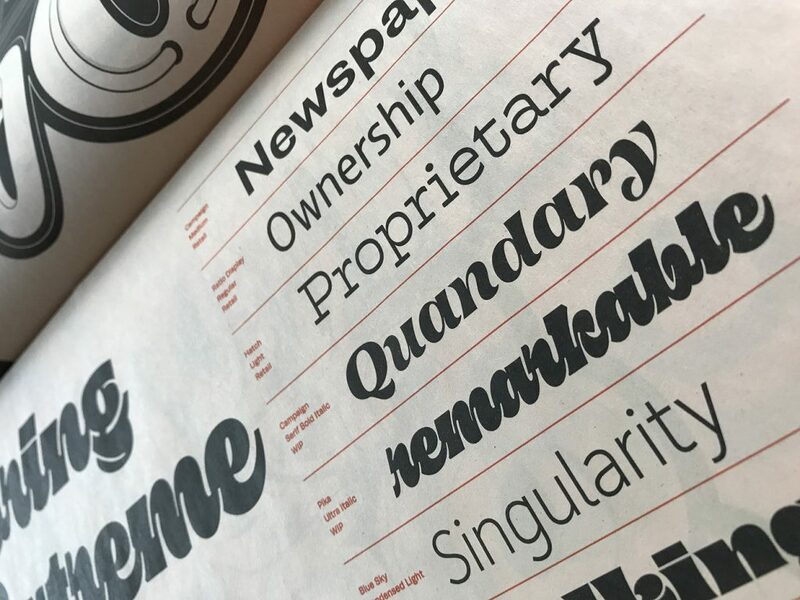 He's printed several type specimens with Newspaper Club over the years – and tried all of our sizes along the way. 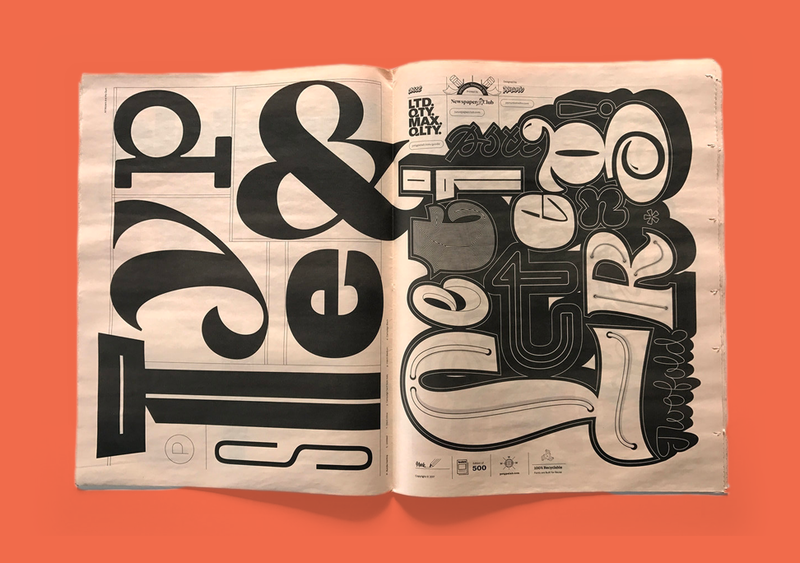 Most recently, he used salmon newsprint for a portfolio to hand out at the Adobe Max Conference in Las Vegas. 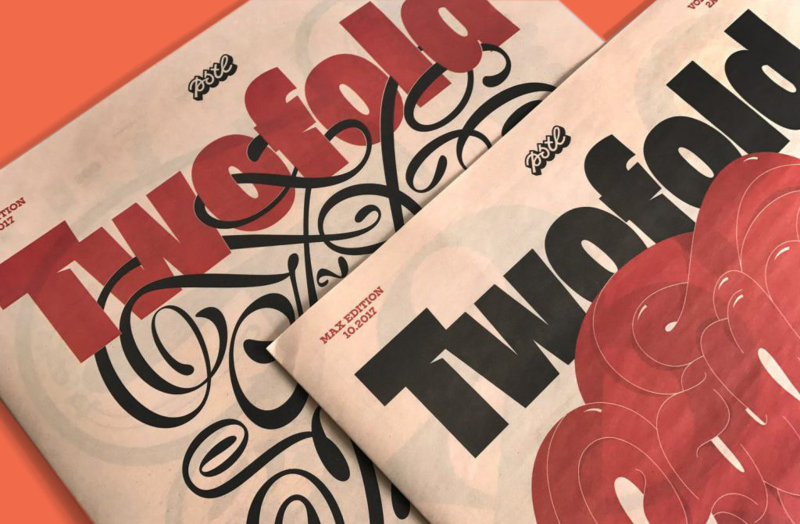 Twofold is a set of 8 posters, folded into a traditional tabloid, with a bold, 2-colour palette. It looks amazing. Below, Mark tells us about designing the piece - which was compared to Herb Lubalin's legendary U&lc magazine! – and the #1 lessons he's learned about working with newsprint. Why a newspaper for Twofold? There's something about newspapers that I just love. The piece was conceived to be a specimen of type and lettering work and the tabloid newspaper size gave me the visual real estate needed to showcase both. The feel and format were perfect for how I wanted to display my work. Can you run us through your design process? The piece was created as a batch of poster spreads, collated into a tabloid newspaper. Whenever I'm designing a piece that has multiple pages, I always start with planning: quick thumbnail sketches to figure out how the piece will pace out to the reader and what content is needed for each page. I knew I wanted to keep my color palette simple. Using salmon-colored paper automatically gave it a different feeling without needing to add more colors. The paper itself was a big hit with a lot of people. They said it reminded them of the U&lc magazine [designed by Herb Lubalin]. You took Twofold to the Adobe Max conference this year. What was it like being part of the Type Village? Twofold was made specifically to be given away at Adobe Max in Las Vegas. I wanted to be able to hand folks something that was going to get them excited about the work and wouldn't immediately be thrown away. It was a great experience to be part of the Type Village. Just having a presence in the exhibit hall was fantastic – I've never talked to so many people. It was a lot of work, but totally worth it. What was the response to the newspaper? The response was great – people were excited to pick them up. Luckily, I kept a small quantity at home so I could offer them to folks who couldn't make it to Vegas. You've printed a few newspapers with us now. What's the #1 lesson you've picked up along the way? I think I've printed one of every size you offer – mini, tabloid and broadsheet – in both digital and traditional formats. The number 1 lesson is to choose your sizes and print method wisely, as well as understanding the benefits and drawbacks of printing on newspaper. Oh, and have somebody proofread your work! What's your favourite part of making a type specimen and what's the most challenging? The best and most challenging part for me is getting to use the type I've created. It's great to change from the designer of the type to the user of the type but at the same time, because I'm so closely tied to it I sometimes find it more difficult to use my own type. What 3 tools do you consider indispensable to your work? Pencil, sketchbook and the computer. With those 3 things I can create just about anything that pops in my head. Where have you been finding inspiration lately? Can you tell us about any upcoming projects that you're excited about? I'm working on a few new typefaces and currently working with Adidas on something...but can't quite talk about that one yet. And last but not least: Where's your favourite place to read a newspaper? Anywhere I can get a cup of coffee.